Late Intermediate Period 1000–1400 c.e. Early Intermediate Period 100 b.c.e.–600 c.e. The boundaries between these temporal divisions are fluid and are mainly a matter of scholarly convenience and convention. Spatially, the Andes region is generally divided into coast and highlands, with these subdivided into northern, central, and southern, yielding a total of six broad geographic zones. 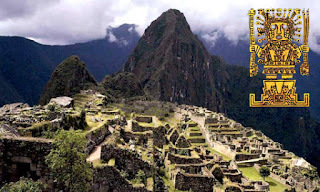 The earliest evidence for the formation of complex societies in the Andes region dates to between 3200 and 2500 b.c.e. along the Pacific coast. Altogether more than 30 rivers cascade down to the Pacific from the Cordillera Occidental of the Andes, many of whose valleys held the development of complex societies during the Preceramic Period. One of the most extensively researched of these coastal zones is the North Chico, a 30 mile wide ribbon of coastland, just north of present day Lima, encompassing the Huaura, Supe, Pativilca, and Fortaleza river valleys. Archaeological excavations in the North Chico beginning in the 1940s have revealed evidence of at least 20 large settlements with monumental architecture, whose origins date to between 3200 and 1800 b.c.e. 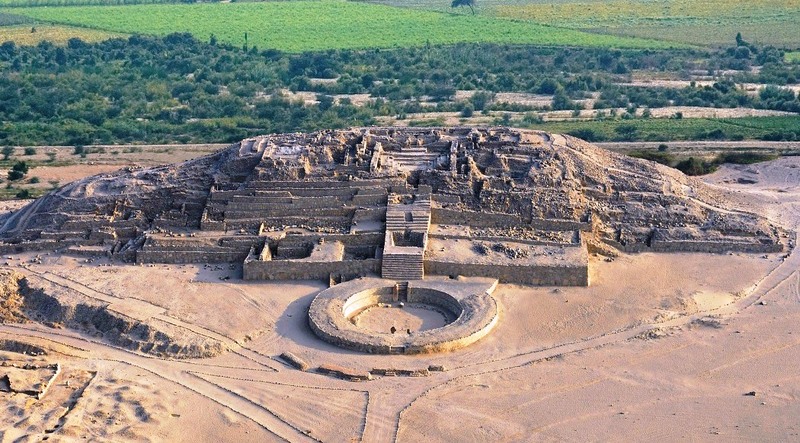 The most intensively researched of these sites are Áspero, at the mouth of the Supe River, and Caral, about 131⁄2 miles upstream from Áspero. 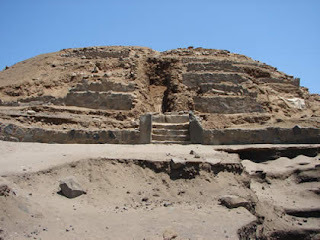 It was his work at the site of Áspero that in 1975 prompted U.S. archaeologist Michael E. Moseley to propose a hypothesis conventionally called the “maritime foundations of Andean civilizations” (MFAC). According to the MFAC hypothesis, the initial formation of complex societies in the Andean region took place along the coast and was made possible through the intensive exploitation of maritime resources. This, in turn, was made possible largely through the cultivation of cotton, which was used to manufacture the nets needed to harvest the coast’s abundant fish, especially anchovies and sardines. Evidence unearthed at Áspero and other sites in the North Chico since the 1970s strongly supports the MFAC hypothesis, though debates continue regarding the origins and characteristics of these societies. The site of Áspero presents numerous anomalous features. It contains no pottery, only a few maize cobs, and some 17 large earthen mounds, some nearly 16 feet tall. The largest structure at the site, a flattopped pyramid called Huaca de los Ídolos, covers some 16,145 sq. feet, upon which, it is hypothesized, Áspero’s elite undertook ritual and ceremonial displays. The site also contains some 30 to 37 acres of domestic middens (refuse areas), along with evidence that its residents were continually rebuilding the mounds and other structures. This latter characteristic is also apparent at other Pacific coast sites. Upriver from Áspero, at the site of Caral, which covers some 150 acres, investigations have revealed some 25 pyramids or mounds, one reaching 82 feet in height and covering some 247,570 sq. feet; two large, rounded, sunken ceremonial plazas; arrays of other mounds and platforms; extensive residential complexes; and evidence of longterm sedentary inhabitation. 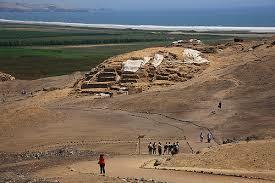 Radiocarbon dates indicate that Caral was founded before 2600 b.c.e. The same dating procedure applied to other sites in the North Chico indicates that most were founded between 3000 and 1800 b.c.e. Middens at Caral and other North Chico sites indicate that maritime resources exploited through cotton cultivation and net manufacture were supplemented by a variety of cultigens, including legumes and squash, and by the gathering of diverse wild foods. In addition to Áspero and Caral, the most extensively researched of these sites to date include Piedra Parada, Upaca, Huaricanga, and Porvenir and in the Casma Valley, the sites of Sechín Alto, Cerro Sechín, and Pampa de las Llamas Moxeke. All fall within what is called the Áspero tradition. Other major Preceramic Pacific coast traditions are the Valdivia tradition (on the coast of contemporary Ecuador); the El Paraíso tradition (just south of the Áspero sites); and the Chinchoros tradition (centered at the Chinchoro complex near the contemporary Peru Chile border). Archaeological excavations at these and other Preceramic coastal sites continue, as do scholarly efforts to understand the civilizations that created them. A related arena of debate among Andean archaeologists concerns the relationship between the Pacific coast settlements and the formation of complex societies in the highlands. Most scholars agree that complex societies began to emerge in the Central and South Central Highlands soon after the florescence of complex societies in the North Chico and other coastal valleys. In the Central Highlands scholars have investigated what is called the Kotosh religious tradition at the Kotosh site. Not unlike those in the North Chico, this site includes a series of raised mounds with platforms, sunken plazas, and an array of small buildings. Sites exhibiting similar characteristics in the Central Highlands include Huaricoto, La Galgada, and Piruru. In the South Central Highlands the emergence of complex societies evidently began in the Lake Titicaca Basin around 1300 b.c.e. Excavations at the site of Chiripa (in present day Bolivia) have revealed that by this date there had emerged a nucleated settlement that included an array of small rooms, built of stone, with plastered floors and walls. By 900 b.c.e. the settlement of Chiripa included a ceremonial center surrounded by residential complexes. Between 1000 and 500 b.c.e. 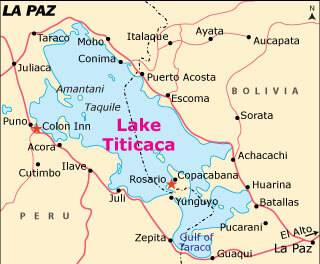 complex societies had emerged throughout much of the Lake Titicaca Basin. To the north the Qaluyu culture reached florescence in the five centuries after 1000 b.c.e. The Qaluyu type site, covering 17 acres, includes a large ceremonial mound, sunken plazas, and extensive residential complexes. Other Qaluyu sites in the north Titicaca Basin include Pucará, Ayaviri, and Putina. The overall trajectory of this period was marked by the decline of North Coast polities and the rise of a series of civilizations and culture groups in the Central and Southern Highlands and Central Coast. After 1000 b.c.e. the Titicaca Basin constituted one broad locus of complex society formation. A second such locus emerged further north, in the Central Highlands and Central Coast, most commonly associated with the Chavín state and culture complex, which first emerged around 800 b.c.e. and declined some six centuries later. At the Chavín type site, Chavín de Huantar, excavations indicate a population of at least several thousand in a settlement covering some 104 acres. At the site’s core lie the ruins of a large and imposing ceremonial temple, dubbed El Castillo, built in the U shape characteristic of the North Chico architectural style. The evidence indicates that Chavín de Huantar was the political center of an expansive polity that extended through much of the Central Highlands and Central Coast. By this time exchange relations throughout the Andes and adjacent coastal regions were highly developed. These exchanges were based less on markets than on institutionalized reciprocal exchanges between extended lineage groups tracing their descent to a common ancestor, called ayllu, as well as between political networks resulting from the growth of state and imperial power. Such exchanges were based on what anthropologist John Murra described in the 1970s as the “vertical archipelago,” a concept that has gained broad scholarly acceptance. In the simplest terms the basic idea is that the Andes region consists of a vertical environment and that exchanges of goods and services took place among members of ayllus who lived in different “resource oases” or “islands” in different altitudinal zones. From the high plateau (or puna, elevation higher than 11,810 feet) came wool, meat, and minerals such as gold, silver, and copper; from the upper mountain valleys (between 9,840 and 11,810 feet) came potatoes, grains, including maize and quinoa, and other crops; and from the lowlands (below 6,560 feet) came maize, cotton, coca, legumes, and many fruits and vegetables. Scholarly consensus holds that large scale state systems such as the Chavín built upon these lineage based reciprocal exchange networks in order to extend their reach across vast expanses of territory without recourse to long distance trade, as the concept of “trade” is generally understood. For these reasons, “markets” and “trade,” as understood in European, Asian, and African contexts, played little or no role in the formation and growth of complex societies and polities in the Andean highlands or coastal regions during the whole of the preconquest period. This was also the case with the Inca. As Chavín declined around 400 b.c.e., there emerged in the northern Titicaca Basin, in the six centuries between 400 b.c.e. to 200 c.e., a site and polity known as the Pucará, with architectural features similar to those described above, and ceramic styles suggesting Chavín influence. On the opposite side of the lake, in the southern Titicaca Basin during roughly the same time period, there emerged the settlement and state of Tiwanaku again, with similar architectural features. By around 400 c.e. Tiwanaku had developed into a formidable state system. Scholarly debates continue on whether, during the period under discussion here, these were true urban centers or ceremonial sites intended principally for ritual observances and pilgrimages. 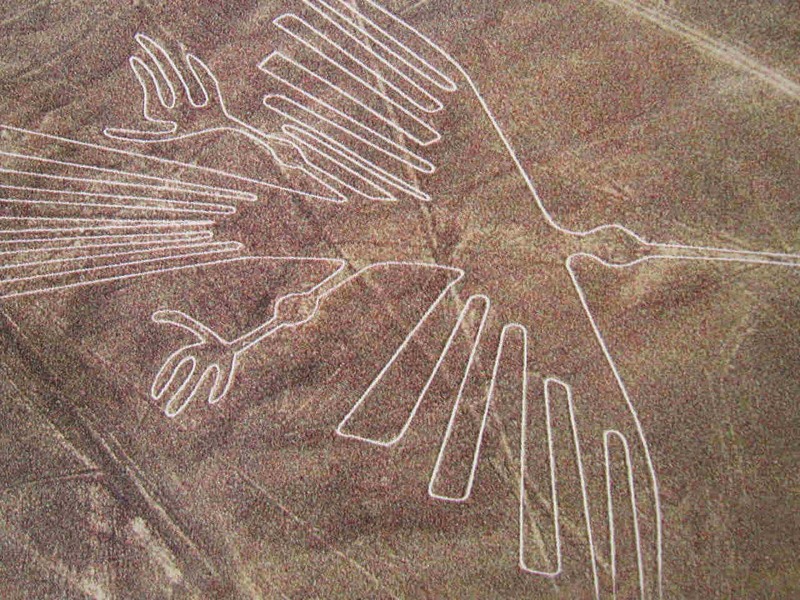 Another enigmatic culture complex to emerge during the Early Intermediate Period was the Nazca, centered in the southern coastal zone around the watersheds of the Ica and Nazca Rivers. Nazca pottery styles went through at least eight distinct phases, until their decline around 600 c.e. 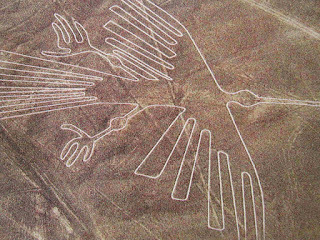 The Nazca are especially well known for their geoglyphs, or large scale geometric symbols etched into the coastal desert. Further north, the Moche were another important coastal culture group and state to emerge in the Early Intermediate. The site of Moche, in the Moche River valley, has been identified as the capital of the Moche polity. Archaeologists consider Moche to have been a true city; perhaps South America’s first. The largest structure at the Moche type site, a pyramid dubbed Huaca del Sol, measures 525 by 1,115 feet at its base and stands some 131 feet tall, making it one of the Western Hemisphere’s largest preconquest monumental structures. All of these developments laid the groundwork for the subsequent emergence of two other major state systems, or empires, toward the end of the period discussed here: the Huari and the Tiwanaku.